Happy girl in chef uniform. Smiling child showing thumb up. What makes a great cook. Woman with children, kitchen. People in chef uniforms smiling. 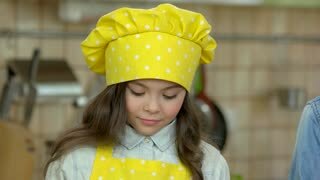 Little girl cooking. 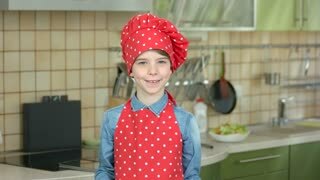 Smiling child in chef uniform. Smiling boy with kitchen utensils. Happy kid in chef uniform. How to make cooking fun. Cheerful girl in chef uniform. Child showing thumb up. How to cook good food. Happy chefs showing thumbs up. Smiling woman with kids, kitchen. Smiling man showing thumb up. Joyful caucasian man making thumb up on green background. Gesture of succsess. 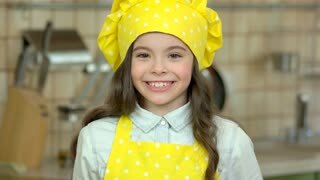 Stunning young beautiful female professional chef smiling joyfully to the camera showing thumbs up her colelague cooking at the kitchen on the background. Profession, employment.